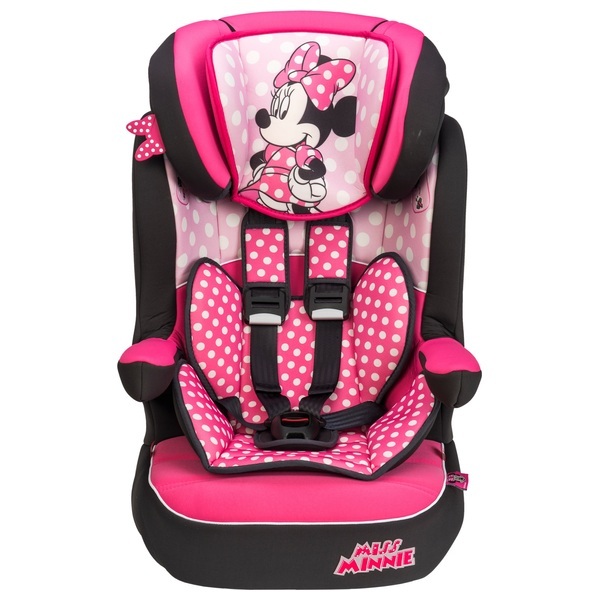 The Imax Deluxe Disney Minnie Mouse Group 1-2-3 Car Seat is as pretty as it is practical! This sweet car seat adapts to meet your child’s safety needs from 9kg all the way up to 36kg, growing with your child from approx. 9 months to 11 years. Forward facing and full of fun, the Imax Deluxe Disney Minnie Mouse Group 1-2-3 Car Seat has deep padding and adjustable arm rests for your child’s comfort. The armrests even swivel to make it easy to get in and out of the back seat. The head support can be adjusted to suit your growing child, keeping them safe however quickly they grow. The Imax Deluxe Disney Minnie Mouse Group 1-2-3 Car Seat is equipped with a 5-point safety harness to keep your child secure. The side impact protection system offers your child’s head and neck advanced protection in the event of a side collision. This secure and stylish car seat can be installed using your vehicle’s 3-point safety belt. Brighten up your child’s journey with this colourful Minnie Mouse car set! Its structure is as tough as its covers are playful. The cover can easily be removed and hand washed to keep your little one’s favourite seat looking fresh.